Bravo offers reasonably priced entrées and sandwiches. 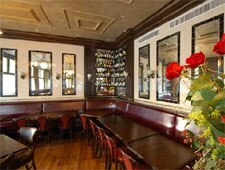 Lunch Fri.-Sun., Dinner nightly, Brunch Sat.-Sun. : Bravo beckons foot traffic with its indoor-outdoor design: a small streetside patio flows into a dining room with bistro tables set strategically around large open windows. Beyond them is a stately space dominated by an elegant curved bar, where a well-dressed crowd sips Stella Artois on draft until well after the kitchen closes. Ideally located across the street from the Trinity Repertory Company, Bravo draws in more than just the theater crowd, however, with its relatively affordable lunches and dinners. From macaroni and cheese to burgers topped with Boursin, Brie or Danish blue cheese, there's something for everyone. We like the lobster club with apple wood bacon, served with pommes frites; the moules Dijon with crusty bread for dipping; and the croque monsieur or madame (ham and cheese, with or without a fried egg, on Tuscan bread). Entrées such as grilled lamb chops and duck l'orange stand side-by-side with comfort food and a selection of steaks and seafood. The wine list is extensive and adventurous, and classic cocktails are skillfully prepared. Finish with the chocolate peanut butter pie, or try the Bravo coffee, with Chambord, Grand Marnier and crème de cocoa.